As faithful readers know, late spring and summer is chick season. 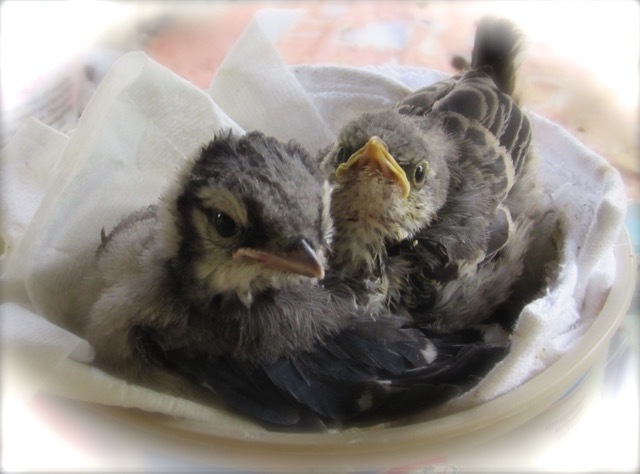 In the past years, I’ve taken fledges from Super Rehabber Nora and finished raising them and sent the survivors off to live their lives. I usually rehab between 60-70 birds a season, a small percentage of the avian patients who need help. So I’ve decided to step up my game. Thanks to Super Friend Gabby, I have a beautiful rehab facility in my garage. I now have a fabulous team of volunteers (I’m looking at you new Super Friends Carey, Bette, Karen and Julie) who are game to feed blueberries and mealworms to a variety of baby birds, all of whom will be STARVING, keep up with the demands of Zen and Snafu, and Clean All the Things! With this super team of Divas, we should be able to rescue over 100 babies this summer. Long-time readers have also been “treated” to my periodic rants about the permits needed to try to save these little critters. I currently have four permits (two state and two federal) which allow me (and those working with me) to stick food in one end of a bird and clean up what comes out of the other end. We are also required to meet CLE requirements, and I have to submit four reports each year (one for each permit). In exchange for this, neither the Great Commonwealth of Virginia nor the Good Old U S of A provides any support. So why do it? I guess the better question is how could we not? But the song is a lie. It sadly does take more than love–and wonderful volunteers and an infinitely tolerant husband (who will help move 120 133 bags of gravel to renovate Gwen and Stephen’s enclosure for eternal gratitude — and a power beveled miter saw, but it’s mainly the gratitude). So I have reluctantly set up an Amazon Wish List, which you can also find by search for Diva Crows on Amazon. Each item has an explanation for why it’s needed (Poop-Off cleaner is fairly self-explanatory; diatomaceous earth might not be.) Please donate if you would like. Otherwise, just keep reading this blog and enjoying everything these birds have to offer. Correction: This post erroneously stated that Super Hub helped move 120 bags of gravel; the correct number is 133. And it should also be noted that he was helping Super Volunteers Gabby and Carey, who were, in the spirit of the Great Gwen herself, In Charge.